You are struggling with balance issues in canter, your coach says – “ok, let’s try some counter canter then” Eh? Why would I try something perceived more difficult when I haven’t got the basic pace right? Well, in order to improve your horse athletically you must always ask him to perform at a higher level, without going past his limits physically, mentally or emotionally and if you develop the counter canter, through a series of exercises it is the very, very best was to improve the canter; not only balance, but straightness and your horse’s attention to the aids. So, what exactly is counter canter? When you deliberately ask for the opposite lead from the direction in which you are going. Counter-canter is a pace not a movement. Your approach to it will have a huge effect on your horse. Firstly, please be mindful not to allow your horse to string out, keep him up and with you. You should avoid stressing him (or you) and keep the canter fluid and flowing. Let’s start with a simple change of bend on the long side whilst keeping your horse on the same canter lead. 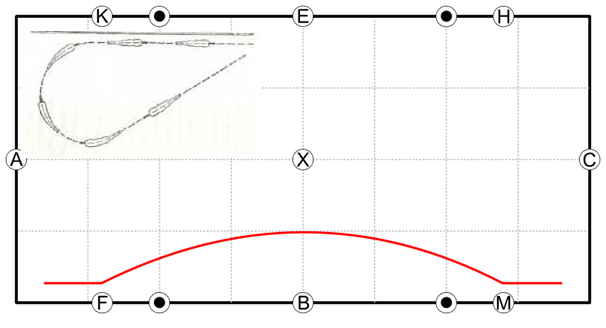 Moving on, you can make that change of bend into a shallow loop on the long side as shown in the diagram. Next, pick up the correct lead, canter around arena and then on the long side ride a loop to the quarter line and back to the track, keeping the same lead. Your horse will be in counter canter when he rejoins the track. Make the join up with the long side gradual and slowly make it sharper. Once you are happy that you can execute the previous exercise, canter a large figure of eight, maintaining the same lead throughout. Finally, you will be able to pick up the figure of eight and on the second half of the movement continue in counter canter on a 20m circle. It’s all about confidence. Treat it as you would your usual canter and your horse will do the same. Most issues occur on corners, turns and changes of rein, so try not to freeze or take your leg off – never good, whatever exercise you are doing. Ensuring the canter is forward is the key. Keep your horse straight (nose an inch to the inside is more than enough). Ask for transitions on the long side as you need your horse to be able to pick up any lead. If it goes wrong, don’t panic, stay calm. Cut off the corners to make it smoother and easier to get round.